A four ball golfer can rely on a teammate to bail him out for a poor hole. 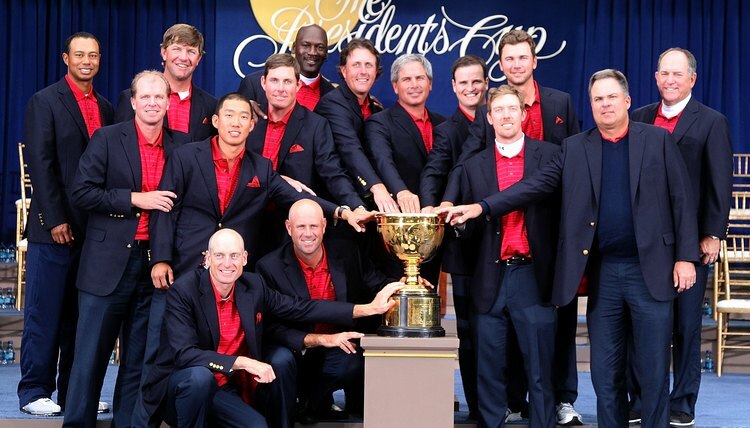 Four Ball is a style of team golf often used in group competitions, including the Presidents Cup and Ryder Cup. Because the rules permit excellent play by one teammate to negate the less than sterling play of a partner, it considered strategically sound to pair an aggressive player with a consistent player. That strategy allows the aggressive player to take chances to score low, while the consistent player is there for a save should his partner's aggression backfire. Divide the four players in a group into two teams of two players each. Play a ball for each player, ensuring that each player plays only his ball. Assess all penalty strokes to the scores of each individual ball as if each player were playing stroke-play competition. Compare the scores for each group of partners at the conclusion of a hole. Discard the higher score for each team. For example, if Team A has a 4 and a 5, the 5 is thrown out. If Team B shoots a 3 and 7, the 7 is discarded. Team A wins the hole by a 3 to 4 score. Add up the total scores of the best ball on each hole for each team to determine which team would be the winner in stroke-play competition. Add up the total number of holes in which each team outscored the other, disregarding the magnitude of the wins, to determine which team would win in match-play competition.